Fidencio Sanchez spends hours selling popsicles each day, usually making just $50-$60. 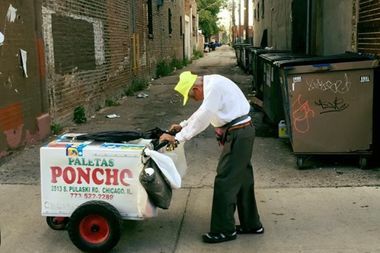 CHICAGO — In just six days, more than 12,000 people from 52 countries around the world have donated more than $330,000 to Chicago's "Paleta Man," the elderly paleta vendor photographed by a sympathetic man who set up the online fundraiser. 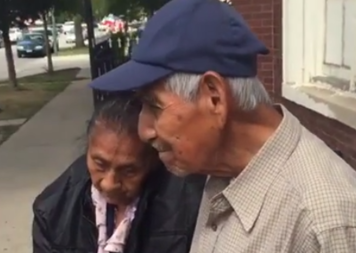 Fidencio Sanchez, 89, has spent years selling paletas — a type of popsicle — on the Near West Side, pushing a cart for hours each day and typically making just $50-$60, said Gustavo Gutierrez, who provides the paleta cart to Sanchez. He retired earlier this year but returned to work after two months when his daughter died. A man who spotted Sanchez last week decided to help the "Paleta Man," creating a GoFundMe campaign. That money will be used to help Sanchez and his wife relax and take care of themselves. Fidencio Sanchez and his wife said they were overwhelmed by all the support they've received since a GoFundMe campaign went viral. The campaign quickly went viral, and more than $100,000 was raised in a single day. Now, more than $336,000 has been raised, and the organizers said they will keep the campaign open for several more days. It's the largest GoFundMe campaign in Illinois, said spokesman Barlett Jackson, and it's among the top 25 largest campaigns in the entire United States. "GoFundMe makes it easy for communities to come together to fundraise for causes they deeply care about," Jackson said. "It's heartwarming to see so many folks rally around Fidencio and donate to the campaign." Gutierrez said Sanchez has spent his entire life selling paletas, going to churches, schools and selling around the neighborhood to the the community. But business can be slow at times, and people worry about his health. Gutierrez has taken to preparing Sanchez's cart each morning, filling it with paletas, so the "paleta man" doesn't have to work harder than he needs to. "The entire community [of] Little Village knows about Mr. Fidencio because for decades he's always been selling," Gutierrez said. "He wants to continue. Which is great in terms of spirit, but we're concerned, of course, that something could happen to him. So we're trying to make it as easy as possible for him ... ."
You can donate to the campaign online.